Decentralized networks coordinated by tokens representing a financial incentive represent a brand new way of creating value. This innovation has pulled many down the proverbial crypto/blockchain rabbit hole (myself included). This has led to many thought experiments among investors as to what the best investment approach is. To consider this, one must understand the concepts of Value Accrual and Value Capture. In their simplest form, they are the relation between value generated (i.e., revenue), and value returned (i.e., gross profit), respectively. Since most cryptonetworks do not operate in a manner consistent with a traditional income statement (no centralized entity! ), these concepts are highly debated within the blockchain ecosystem. Many value accrual theses have been introduced, including Fat Protocols, Fat Monies, and the Utility Hypothesis, to name a few. 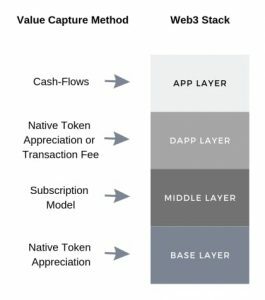 These well thought out arguments have led to me to put thought into how value will be generated across the ever-changing Web3 stack. For the sake of consistency with the order in which the stack has been developing, I will begin with the base layer. By far the bulk of investment and human capital to date has gone toward the development and proliferation of base layer protocols. Before the ascent of cryptoassets, protocol development of the internet had been driven by the support of foundations and driven by ideals. But the past couple of years have introduced significant financial incentives through massive ICO raises, such as EOS ($4B) and Tezos ($232M). 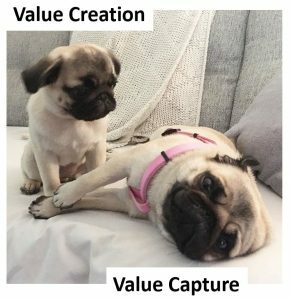 Value capture – Relies on the appreciation of the native token. I believe this is more likely to occur for a Store of Value use case than a smart contract protocol. Middleware can be characterized as tooling that facilitates the development of applications on top of a protocol. To that end, this segment is critical to address the shortcomings of today’s blockchains. Value capture – While most are freely available to use as they are prioritizing market share, I expect them to introduce subscription and/or freemium models in the future. This is the frontier of blockchain development, with projects promising more use cases and disruption than we have ever seen before. While Dapps have yet to take off in a meaningful way, we are seeing major cracks in the idea that most dapps need their own token and that they can rely on its future appreciation as their business model. The bar is incredibly high to justify the introduction of a native token and no, using it primarily as a fundraising mechanism is not a justification. Value capture – Most of these strategies focus on one of two paths, (1) introducing a native protocol token such as an ERC-20 (hello 2017 ICO craze) and (2) building a marketplace and taking transaction fees in the form of a base layer’s more liquid coin, such as what Cryptokitties is doing by accepting ETH. Going forward, I expect a broader shift toward Dapps pursuing route #2 or using a liquid stablecoin instead. Many in the blockchain space bemoan the fact that companies with a centralized business model, such as Coinbase, play such an important role. The fact is, if a decentralized future is to ever reach billions, we need companies building on top and on the periphery of decentralized networks who will abstract away complexity and provide superior UX so that anyone can use these services without jumping through unnecessary hurdles, even if they operate in a centralized manner. I strongly believe there is and will continue to be, a need for these types of traditionally structured businesses. Additionally, protocols also view the value in these companies as evidenced by Stellar’s recent acquisition of Chain for a rumored $500 million. Value capture – Good old cash flows. In summary, the below is what the simplified stack looks like from the top down. It’s important to note that companies and projects are constantly experimenting with business models and there could be outliers to how these categories have been defined.